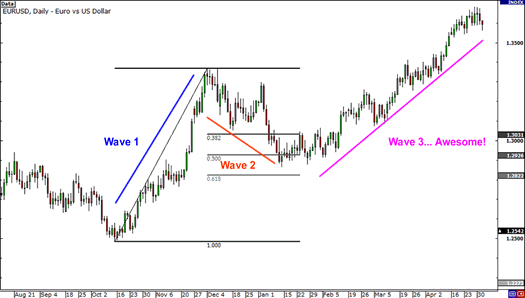 Today, we will be looking at how the Elliott Wave Theory can be practically applied when trading forex. In order to do this, we will look at some trade setups, and use our knowledge of Elliot Wave Theory to help us choose entry, exit, and stop loss levels. So, let’s assume that you wanted to begin your wave count, because you have noticed that the price seems to have bottomed out, and that a new upwards move is in evidence. 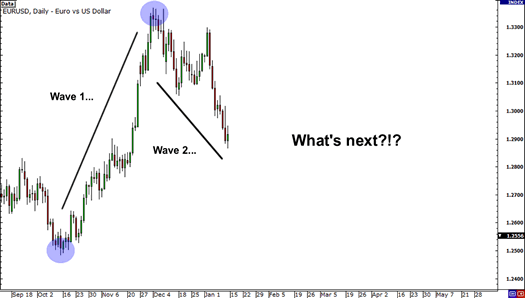 Therefore, using your Elliott Wave Theory knowledge, you label this upwards move as Wave 1 and label the retracement as Wave 2. Therefore, you set up the Fibonacci tool to see if the price is indeed at a Fibonacci level, and in this case, it is sitting quite neatly around the 50% level. 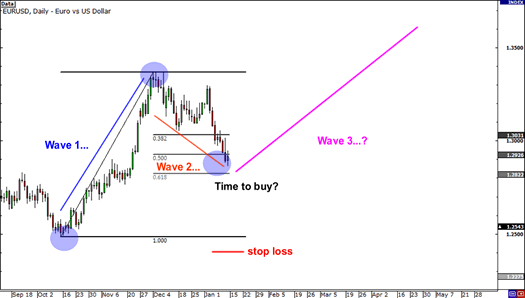 This means that we could be looking at the start of Wave 3 – a very good time to place a long trade. Now that we have our entry level, it’s time to look into where to put your stop. Remembering Rule 2, which states that Wave 2 can never go beyond the start of Wave 1, you decide to set your stop below the previous lows at the start of Wave 1. In this case, it turns out that your Elliott Wave analysis was spot-on, and it allowed you to catch a huge upwards move. 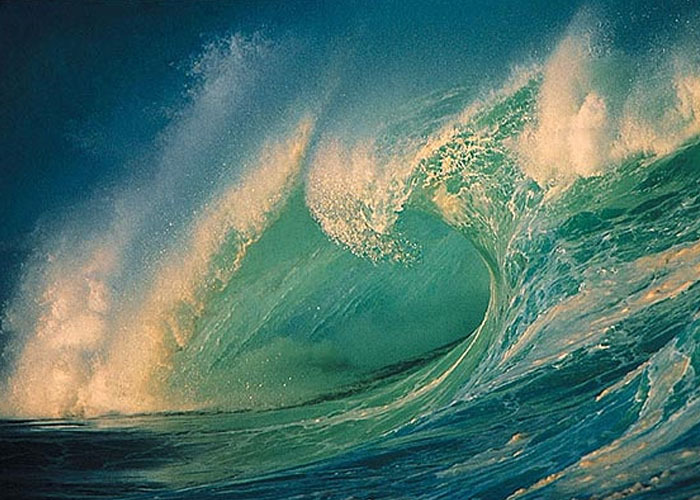 In the next (and final) part, we will be looking at another example of using the Elliott Wave Theory in practice, as well as summarising the main points from this series.